of three days. 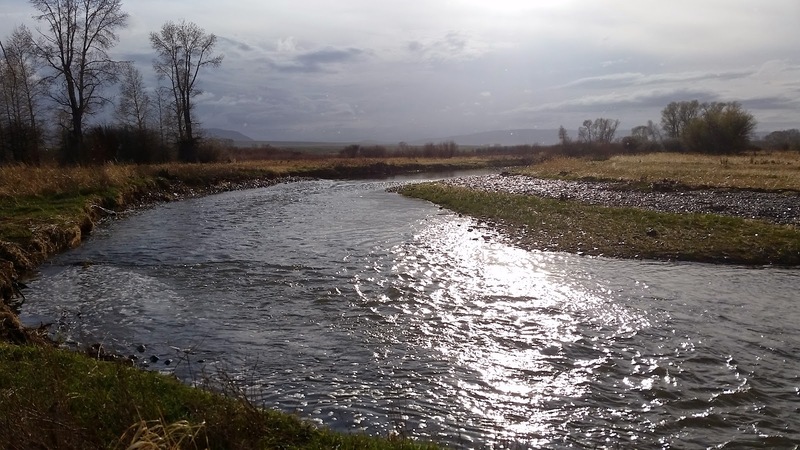 We set up camp along one of my favorite smaller-water brown trout streams. 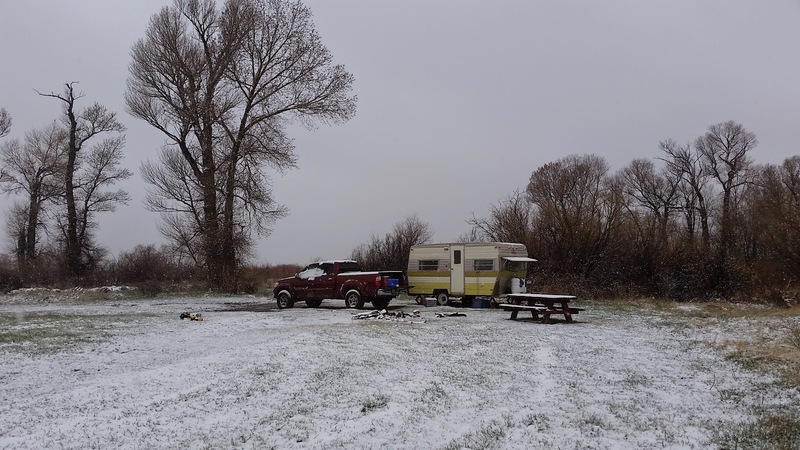 On trips like these I generally sneak out of the camper in the dark, fish the dawn hours, and return after everyone else is up and ready to do whatever is on the list for the day. I took my son with me on this first morning. He wanted to go, which isn't always the case. Naturally we were slower in getting started than I would have been alone (by a lot), but no matter, there were two more mornings to go. 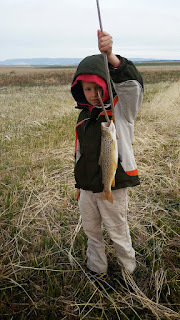 My son views fishing as a harvest - he's there for the picking. It never fails that after a fish is caught, he is ready to go cook it right then and there. 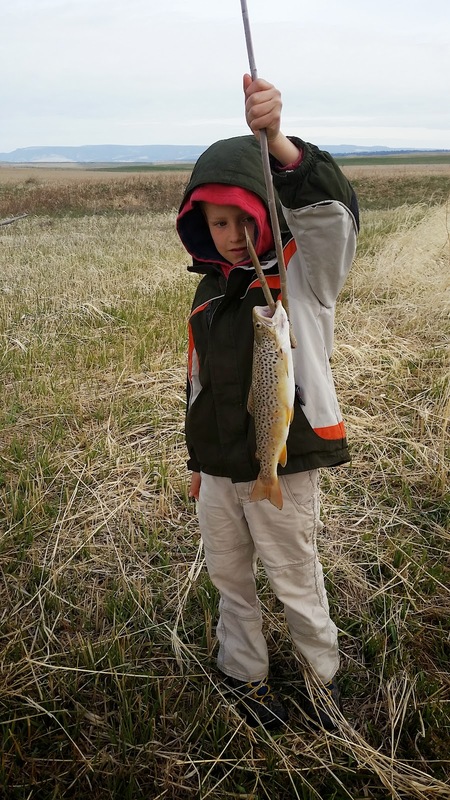 I slid our first catch onto a stick and he happily carried it for a couple more holes, but it was obvious he was ready to take this brown back to the camper and get it into a frying pan. We spent the rest of the day exploring some mountain roads and trails, returning to camp in a spring rain shower. 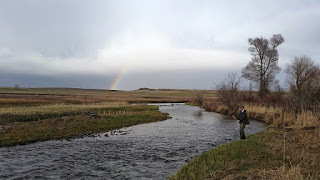 There were a couple of prime time daylight hours left, so I suited up in waders and rain gear and strung up a fly rod. I'd seen some variety of stonefly hatching that morning, so I started with a stonefly nymph under a high-riding stonefly dry. The dry was more of an indicator than anything, but I'd be happy to generate some surface activity if I could. was a better choice. So, I did both. I tied on a foam-backed moorish mouse pattern and trailed it with a cone-headed olive blossom special. 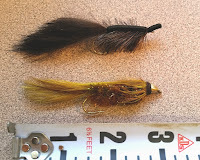 Both seemed over-sized for the little water - but nothing is oversized on a brown trout stream. Neither fly fished at its peak performance. Each was a bit inhibited by the other. But I pressed forward with the experiment. The mouse rode a little lower than it should, but the action was fairly true and it skirted across the riffles just fine. The streamer swung behind it, perhaps not as deep as it otherwise may have gone, but a decent swing nonetheless. There was a "jigging" retrieve I could produce with the streamer because of the mouse, where I could hop the mouse out of the water and back in again, essentially letting the streamer jump and then free-fall like a jig along undercut banks. It was an action I couldn't have achieved with just the streamer alone. The first hit came on the streamer, and in mid-swing near the center of the stream. I didn't notice the mouse disappear, I just became aware of the dead weight. The hookset brought heavy head shakes, a flash of gold beneath the surface, and then my double fly rig sailing back at me through the air. The second hit came a couple casts later, from the same hole but across to the opposite bank. This one took the mouse in a satisfyingly explosive strike that, quite honestly, caught me off guard. The line came tight on a solid fish that appeared to be doing a gator role on the surface. Again my double fly rig came flying back at me through the air. with less than an hour of daylight remaining. I lost a third fish that took the streamer again. Ahead of me was a hole against a sandstone cliff that forced the river to make a 90 degree bend. I've encountered fish stacked along that wall in the past, so I decided to skip what was in front of me and hike to that hole to finish out the day. After all, I had tomorrow and the next day to refine my methods and hit more of the stream that I was skipping over. I had action right away in the hole along the sandstone ledge. The stream hits the wall in about the middle of its length. In years past it has flowed along the entire wall, hitting it further up. Right now that makes for a deadwater backchannel, the mouth of which is separated from the stream by an eddy rotating rapidly back upstream. 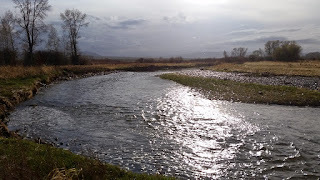 I launched the mouse and streamer into this eddy and missed two browns that aggressively chased the streamer from the eddy to the main flow. streamer. The last hit hard and took off downstream without breaking the surface. It took all the line I had out and then peeled more from the reel. I actually had to chase it, reminiscent of running along behind a steelhead. The fish hadn't felt that large at first, but now I was beginning to wonder. It was really getting too dark to see much, but the first glimpse I got proved it wasn't any giant and I speculated that it was foul hooked. When I finally got it under control in the tailout of the next hole down, I found that it was hooked neatly in the jaw. It may have gone 19 inches. I didn't measure, but it wasn't 20. It wasn't a bad fish, but it had fought way beyond its actual size. 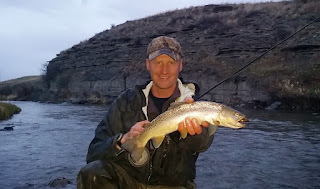 Pound for pound (or inch for inch maybe), this has to have been the hardest fighting trout I've tied into this spring. Even a brown I caught in the Missouri back in February, or another back in October in another river, either of which could literally have swallowed this one whole put up such mellow fights that it wasn't until I saw it that I realized how big it was. I hiked back to the camper utterly satisfied with my experiment. It'd been fun to find some bigger browns and to catch them on fly gear. As I hiked back in the dark, my mind circled back to the larger fish of the evening that I hadn't hooked, and I thought that perhaps I'd pass back over them at first light with some big plugs, or maybe the streamer again. At this point it was a toss up. Either way, I felt like the morning had some awesome potential. Back in the camper and playing a card game with my family, the rain began to drum on the roof. It drummed and drummed. It fell heavy and it fell steady. It continued after lights out, and was still at it any time I woke up during the night. I began to wonder what the river would look like in the morning. If it would even be fishable. Dawn light brought the end of the rain, but the river was certainly up. It was stained but not so muddy that I didn't try. 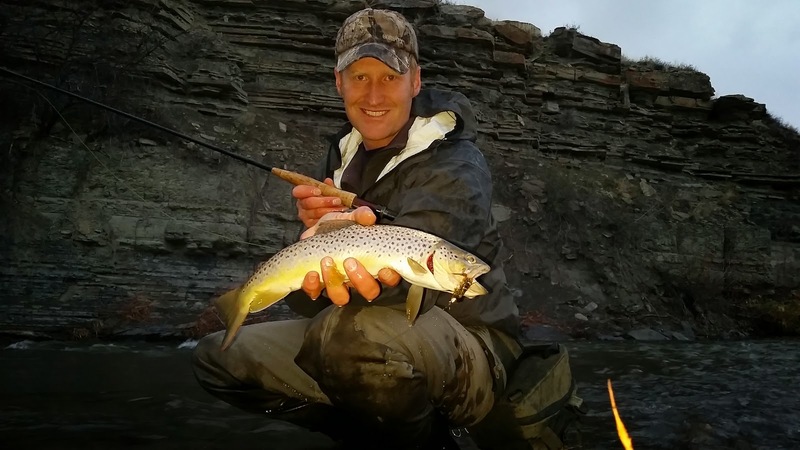 Sometimes browns, and particularly big browns, will be out on the prowl in a freshly rising river. But there was no action, and the river muddied further as a walked along it. 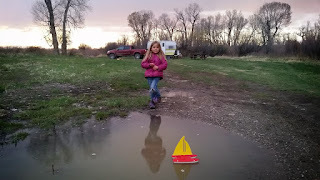 By evening, after returning from another explore into a neighboring mountain range, the river was trashed and logs were floating down it.That evening the only fishing was done by my daughter who was absolutely thrilled to intently search all the puddles and fish the earthworms out. On the last day, we woke up to a blanket of snow. The clear forecast had completely deteriorated. We packed to leave in heavy, wet snow while the swollen river continued to rise from the rain that had ceased falling 24 hours earlier. Spring is always an adventure. Sure am glad I got the couple hours in that I did, but it left a big, unsatisfied void in my appetite to fish that river. At least there was good food, a warm camper, and fun times had with the family in the outdoors of Montana.